Millikin biology professor Dr. David Horn is campaigning for the position of Decatur mayor. His platforms include neighborhood revitalization and environmental improvements. Dr. Horn has lived in Decatur for fourteen years and currently serves on the city council. He has been campaigning since he announced his bid for mayor last November. “The reason I’m running for mayor is because I care,” Horn said. Dr. Horn’s primary concern is Decatur’s population growth. According to him, the population of Decatur has declined steadily for the last several years. He believes that improving housing can help achieve his goal of retaining Decatur citizens and enticing more people to move to the city. These incentives involve reduced property taxes for incoming Decatur citizens, which Dr. Horn believes will appeal to recent graduates. As a biology professor, Dr. Horn is also interested in ways to improve the environment on a local level. He thinks that the demolition of uninhabitable houses will result in natural lots. These lots would attract wildlife and help with water runoff, which would have many ecological benefits. Dr. Horn also wants to repurpose some of these lots into community gardens and parks. “I really think that’s going to increase the livability, the vibrancy of the city,” Dr. Horn said. Dr. Horn plans to continue work on some of his current platforms as well. He strongly disagrees with video gambling, and he has fought for the eradication of video gambling establishments in Decatur. He is the only member of the city council that has voiced this view. One reason for his opposition to video gambling is its impression on prospective Millikin students and their families. 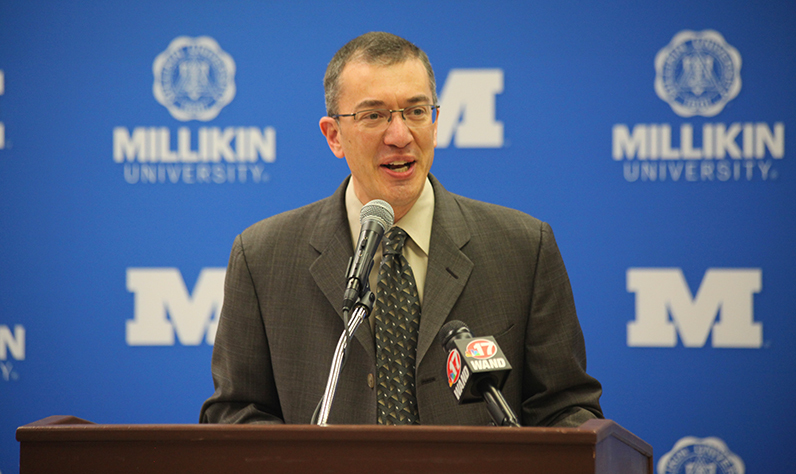 This devotion to Millikin has played a major role in his campaign. Horn moved to Decatur to accept his current position at the university. He believes Millikin is a major part of the city and he urges students to become involved in local politics. Horn will continue to campaign until the election on April 2nd. He believes that local elections are important, and he encourages students to vote if they can.